Google officially recommends not to use more than one include filter, because it can lead (rather unintuitively) to excluding all the data in an Analytics profile. But sometimes using more than one include filter is the only way to catch the purple squirrels. Let me explain. Unfortunately, even though he’d thought outside the box and (very creatively!) tried to use a single include filter based on Campaign Target URL, he was not successful. In this case, a single include filter will simply not suffice. He needs one include filter for the traffic medium (organic) and another include filter for the set of pages visited (the specific subdirectory). It all boils down to the types of data you’re trying to include. Ask yourself, can members of one type be members of another type, or are they mutually exclusive? And here we want data that belongs to both sets, i.e. the elusive purple squirrels. In this case we absolutely can use two include filters. 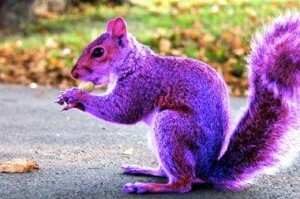 We can say “include only purple things and include only squirrels” because then we’ll end up with the purple squirrels. First, the standard warning. Don’t apply new filters to existing profiles! 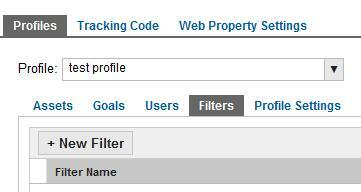 Always create a new profile or use a test profile to “test drive” new filters and make sure they get the data you want. Now create your two include filters. Navigate to the new/test profile, then go to the Filters tab and click +New Filter. 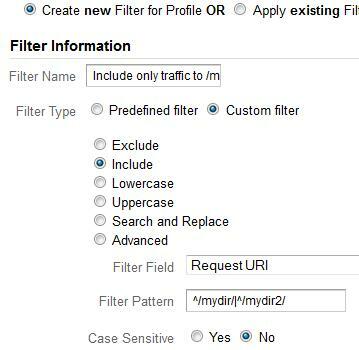 To include only organic traffic, create a custom filter. 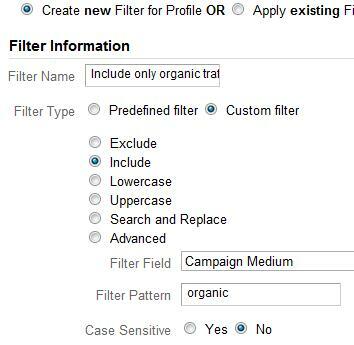 Choose “Include” and Filter Field “Campaign Medium” and Filter Pattern “organic” (don’t include the quotes). Click Save. Then create another filter to include only traffic to a subdirectory. You actually have two options here: One way is to create a predefined filter. Choose “include only” and “traffic to the subdirectories” and “that are equal to” and then enter the subdirectory, such as /mydir/. So the other way to include only traffic to a subdirectory, and the only way if you need to use regular expressions, is to create a custom filter. Choose “Include” and Filter Field “Request URI” and Filter Pattern ^/mydir/. In a custom filter I can use special characters from regular expressions, like the caret (^). The caret means “starts with”. So I enter Filter Pattern ^/mydir/ if I want to match pages like /mydir/abc.html but not /sub/mydir/abc.html. To match /mydir/ at any level, just leave the caret off. And voilà! With an include filter for organic traffic and an include filter for /mydir/, our reader has a new profile containing exactly the data he wants. Remember how I said you can’t include only squirrels AND include only dogs? We can actually work around that, using custom filters. What I’ll do is create a custom filter that says “include squirrels OR dogs” because I can use a special character from regular expressions called the pipe (|). The pipe, or vertical bar (found above the Enter key on most keyboards), simply means “OR”. 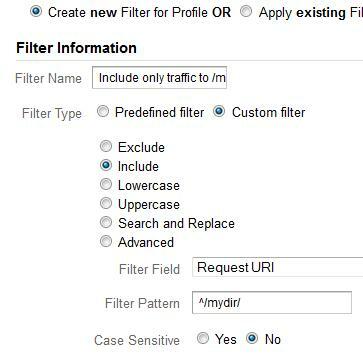 To include traffic to /mydir/ or /mydir2/ create a custom filter, choose “Include” and Filter Field “Request URI” and Filter Pattern /mydir/|/mydir2/. To match pages that have to start with /mydir/ or /mydir2/, change the Filter Pattern to ^/mydir/|^/mydir2/. What are some other issues you’ve had with filters? Have you discovered creative ways to get the data you need? Let me know in the comments.